I had a colleague who believed that everything could and should be optimised. He had a diet Linear Program which he used to plan his meals to provide optimal nutrition. Unfortunately the Linear Program didn’t seem to have a constraint to ensure the food was palatable, and he would eat combinations like sardines, broccoli and sunflower seeds for lunch. My colleague also believed that there must be an optimal way to teach, that would maximise the learning outcome. I am doubtful that there is such a thing, bearing in mind the diversity of human experience. However I like the idea of imagining the best possible method, unconstrained by class-size, resources or instructor time and competence. I am currently developing on-line resources to help people learn statistics, and though I do not presume to claim that they will be optimal, I’d like for them to be really, really good. On-line provision can never do some of the things that human interaction can do, but by the same token, on-line materials are infinitely patient and calm, and should always be correct. The problem with education and learning is that it involves people. People are not all the same and what works for one person may not work with another. Circumstances change. And there is the problem of motivation. In order for students to learn, they must engage with the material for an extended length of time. This requires motivation. Some students are intrinsically motivated, and will learn for the sheer joy of it. This intrinsic motivation is not common in operations research, and even less common in statistics. Surprisingly, most of our students are not enrolled in a statistics class for the intrinsic rewards it brings and the excitement that the subject engenders. When I was in my second year of high school there was a city-wide mathematics competition, which included a class project. 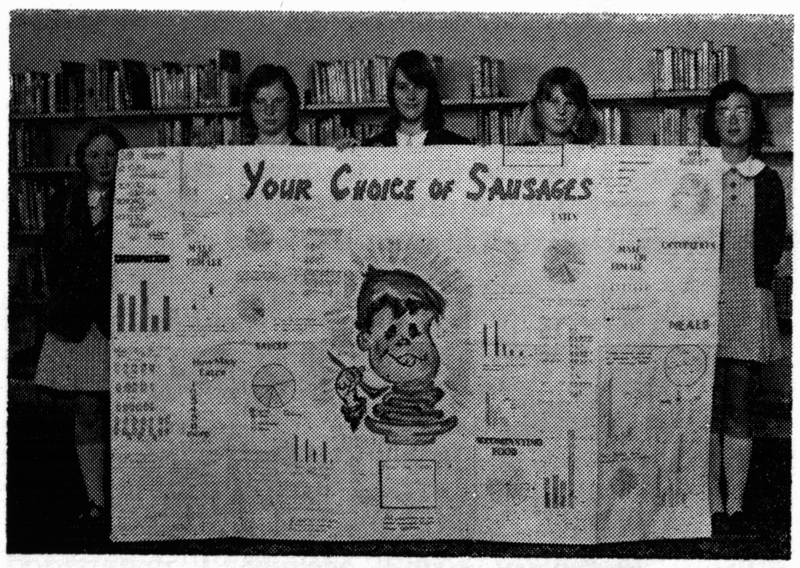 I decided our class should enter and set about running a statistical survey on, of all things, sausages. My maths teacher gave me the resources I needed and ran off the questionnaires on the Banda machine (mmm methylated spirits!) (Showing my age here, I know! – at least I was a student and not the teacher in this story). We had about three or four pages of questionnaire about what types of sausages people liked, how often they ate them, what they ate them with and other questions that I can’t remember. Each girl took home some of the questionnaires and had friends and family fill them out. (No informed consent was needed in those days). My friends and I counted the responses by hand and gave the summary values to class members to draw barcharts and (I’m embarrassed to admit) pie charts. An artistic friend drew a really great illustration in the centre, and we stuck all our graphs onto a large piece of paper – about 2m square. We didn’t win a prize, but we did get an honourable mention, and I got my photo in the school magazine. I do remember learning that our way of counting up did not allow for multivariate analysis. I would have liked to look at the relationships between our variables, but it would have taken too long to recount everything. The photo from the School Magazine 1975. Dr Nic is second from the left. Was that an optimal learning experience? Not really. I was motivated, and had fun, and learned things, but I could have learned a lot more with some more guidance from the teacher. To be fair I was possibly too stubborn to let her help us. I didn’t even know that I was doing a statistical analysis at the time, and didn’t encounter the subject of statistics until university. Various methods of teaching and learning have gone in and out of fashion over the years. Someone once told me, “Never run after a bus, a woman or an educational theory, because there will be another one along soon.” A trifle sexist, though not as bad as “A woman, a dog and a walnut tree, the more you beat them the better they be,” which appeared in my school recipe book. But I digress. My experience with the sausage survey was an example of Discovery Learning. It is a great way to learn if you have lots of time to make all the mistakes everyone else has ever made on the way to gaining knowledge. I’m quite keen on guided discovery, myself, and think it may be getting closer to optimality! Guided discovery reduces the number of dead-ends down which learners will travel, while helping them construct their own (correct) meaning from the experience. I had a great experience learning to program at university. I had a friend who was a year ahead of me, majoring in computer science, so I had a tutor on tap. I would set about writing the assigned program, and when I got stuck I would ask Nick. He would give me just enough help to get me going again, and the odd hint if I were using a clumsy algorithm. Was that optimal? Maybe I should have been searching more to find the answers. It was pretty efficient, and as I rather fancied Nick, it was socially rewarding as well. I find programming is more intrinsically motivating than most learning. You write your program and run it, and there is nothing more exciting than seeing it work. It gives feedback of success, though the error statements are less illuminating. The optimal learning method should involve small groups of learners. As people discuss ideas they develop their own understanding. There needs to be an expert around who can help them when they get stuck and point them in the right direction. This sounds like the Oxbridge model, where students meet with tutors in very small groups and then go off for a week to do their learning. A week might be a bit too long in this instance. So my unconstrained optimal solution involves small groups of 2 or 3 students being given projects, preferably related to their personal interests. They grapple with this project, while maintaining contact with a helpful and all-knowing tutor. Resources are available for analysis and for reference. The projects are carefully selected to provide different issues to help students develop the required competencies. The students present their project results to other students. Sounds wonderful. And expensive. How can we apply this in a class of 30, 100 or 600 students? How do we incorporate testing and assessment in order to provide a grade? How do we provide such a service on a limited budget? We examine the aspects that make this setup ideal, and try to replicate them in other ways. In particular we can think how technology can be used to enable this kind of learning. In another post I will examine how Coursera has approached teaching statistics, and see what is done well and how that can be improved. I suspect that it’s a lingering cultural side-effect of the discovery of time-and-motion studies to think that not only must there be optimum ways of doing things, but that there must be a unique optimal way of any particular task. The idea that there might be several methods (say) of learning spelling each as good as the other — or, more, that there are some methods good for some people and useless on others, with other methods good for a different set and useless for a different group — is a surprisingly difficult one to have gain acceptance. This seems weird, considering you can get 84 different kinds of store-brand peanut butter and nobody thinks the peanut butter aisle dangerously un-optimized. I was, as a painfully shy student, not at my best with extremely small groups; I felt more comfortable and believe I did better in classes of around a dozen students. And that guides my tastes too; I feel more comfortable teaching to around a dozen students than to too many more or fewer. What I need is to be matched up to the students with that kind of comfort level from the class size. Ah, the “O” word. Whenever I hear its dulcet tones, the immediate question that comes to mind is “Optimise what?”. Are we optimising the depth of learning? the breadth of learning? the speed of learning? the joy of learning? the stress of the teacher? And how do we measure these things? Even without constraints , whatever we choose to target for optimisation and however we choose to measure that influences greatly the answer to the question of what optimal teaching looks like. The reality, of course, where human beings are concerned, is that we almost never optimise one thing. It’s more like a highly-dimensional response surface function. Add in the complexity that not everyone is wanting to optimise the same things with the same weights and you very quickly throw up your hands and go instead. Does that mean there’s no optimal solution? Yes, in a capital-T Truth sense. But, does that mean we can’t learn something ourselves, and potentially improve outcomes in general, in pursuit of this deal? Of course, not! As learning becomes digitised, the idea of optimising becomes romantically exciting, but realistically we will find a range of teaching options will rise to the surface. It wouldn’t be surprising to find that each targets a slightly different optimisation question – one might emphasise self-learning and thoroughness in exchange for speed, another might encourage remote interaction and group activities to increase joy. Perhaps the next question needs to be – what are the various clusters of optimality criteria that would most efficiently satisfy the largest portions of the learning base and what would courses tailored to them look like? Heady stuff. I think I’ll go now. Thanks for your excellent comments. Great food for thought. I suspect there are also cultural issues. For instance are we teaching students to accept the instuctor’s words and reflect them back or to think for themselves and question current ideas.